My phone is going off with calls and texts regarding the holidays. Everyone is trying to get dates and times set as well as who is going where. Table settings are being planned and the menu is being written in pencil, sure to be worn from eraser marks and constant changes right up until the food is on the table. With so much going on I wanted to make my list and check it twice. 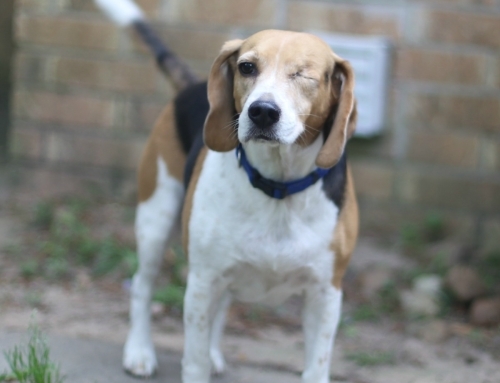 I also want to make sure that the meals I am serving to guests who may be staying awhile are easy and don’t take away from my visitation time! 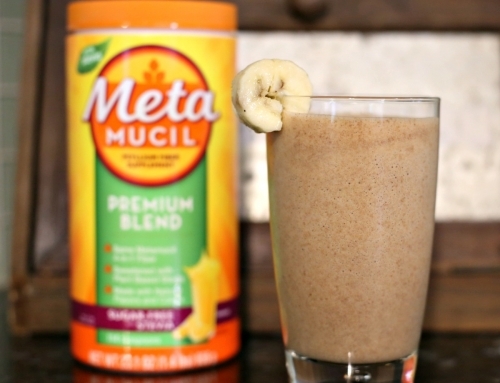 Enter a protein that I think most of us may not know how to prepare but that offers amazing flavor and an elegant meal for any occasion. 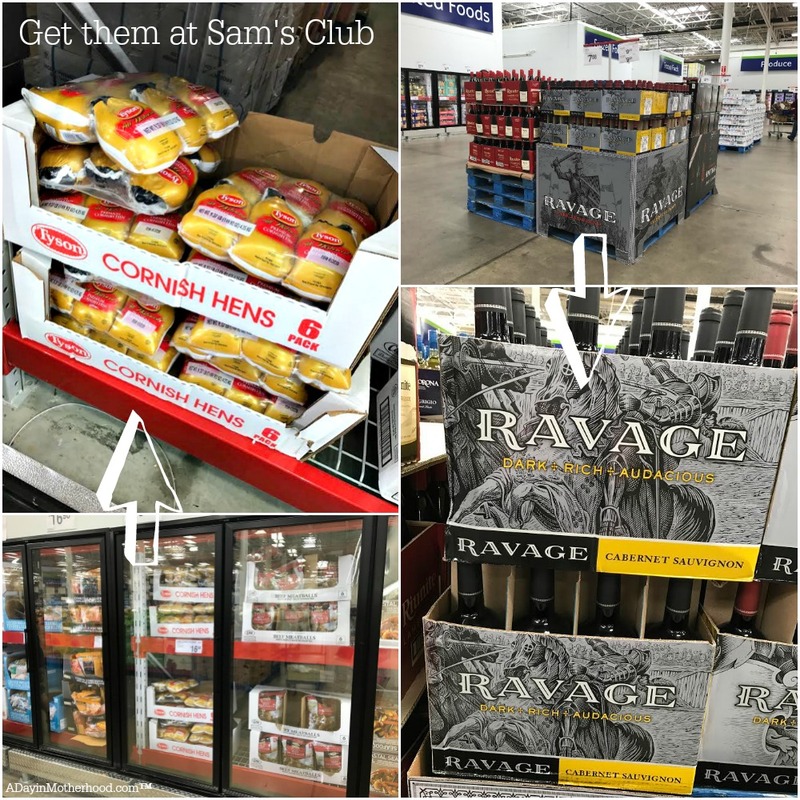 Tyson® All Natural Premium Cornish Hens are available in 6 packs at Sam’s Club. These little hens can be roasted, boiled, fried and even cooked in the Slow Cooker. 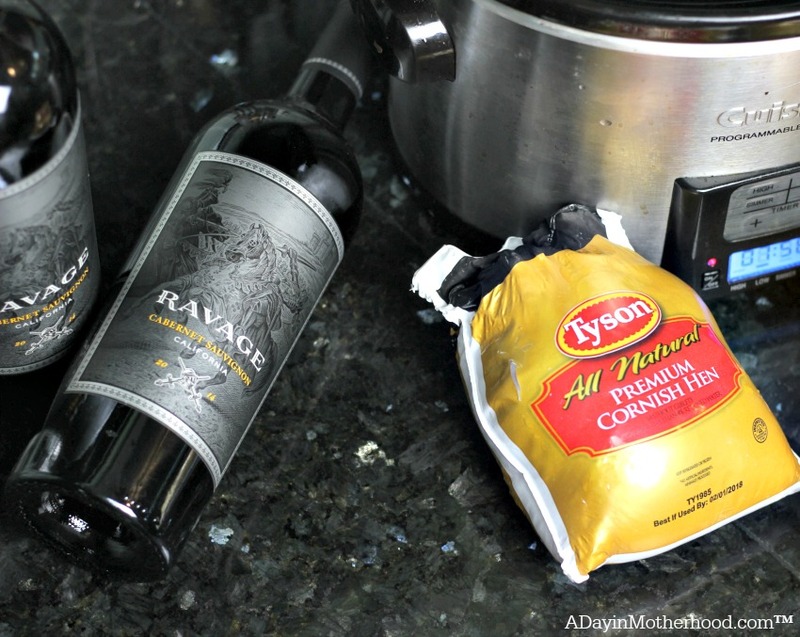 Pairing them with the Constellation Wine variety, Ravage Cabernet Sauvignon, makes them an elegant choice as well! 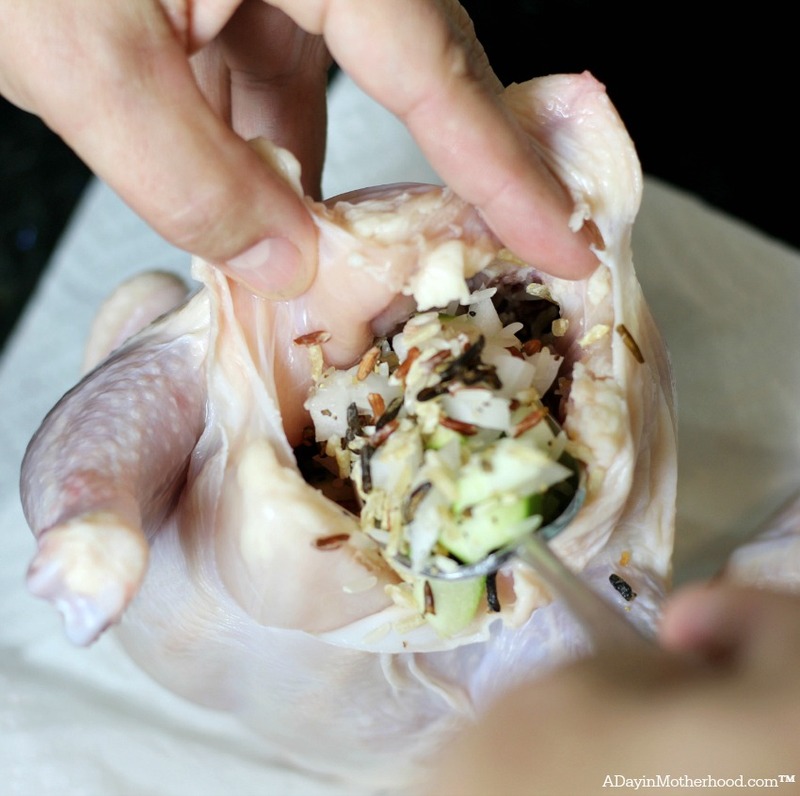 So in the interest of creating something amazing, but easy, for my holiday guests, I am making Slow Cooker Wild Rice Stuffed Cornish Game Hens! It is so easy you may have to have them for dinner tonight! Learn how to cook them other ways too with this How to Cook a Cornish Game Hen video! This recipe is incredibly easy and starts with a trip to Sam’s Club and the picking up of their Sam’s Club Instant Savings booklet. With an instant coupon for $3.75 off the Tyson® All Natural Premium Cornish Hens, it is a valuable resource that will save you big! Shop the frozen section and find the 6 pack of the Tyson® All Natural Premium Cornish Hens. 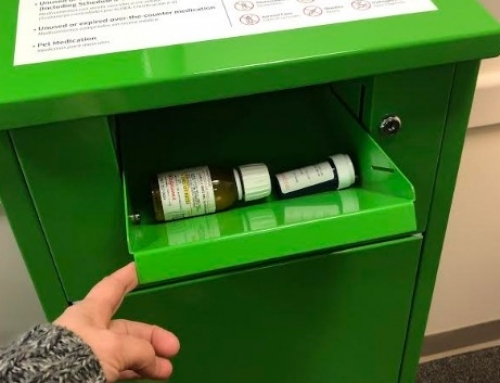 I found mine on an end cap. I turned around and, in the middle of the store, on a pallet, was the Constellation Wine variety I wanted, Ravage Cabernet Sauvignon. I don’t drink a whole lot but when I do, I like a wine that is easy to drink and that enhances the recipe I am making. 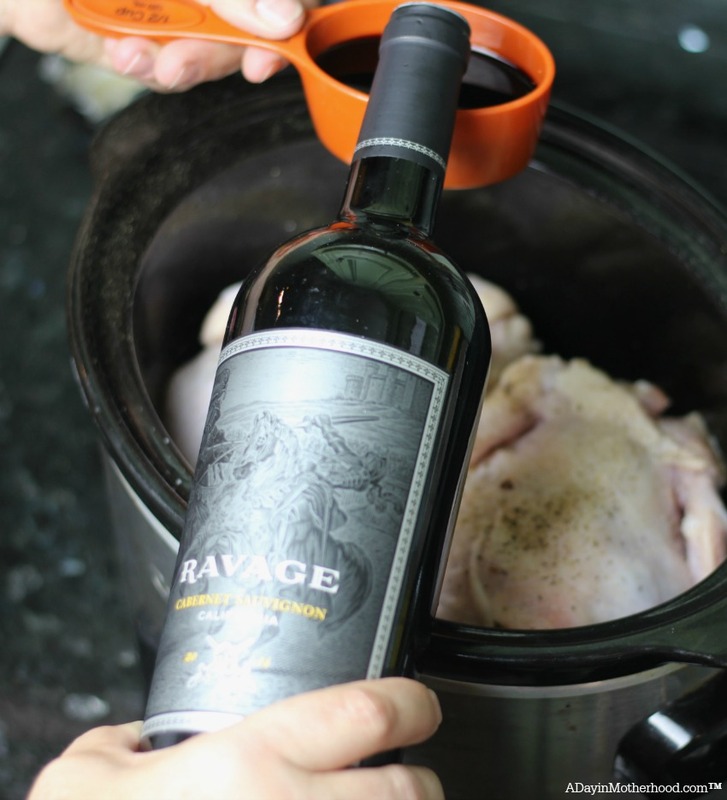 Ravage Cabernet Sauvignon pairs perfectly with the Cornish game hens! Now that you have your supplies on hand, let’s talk about the easiest recipe ever. 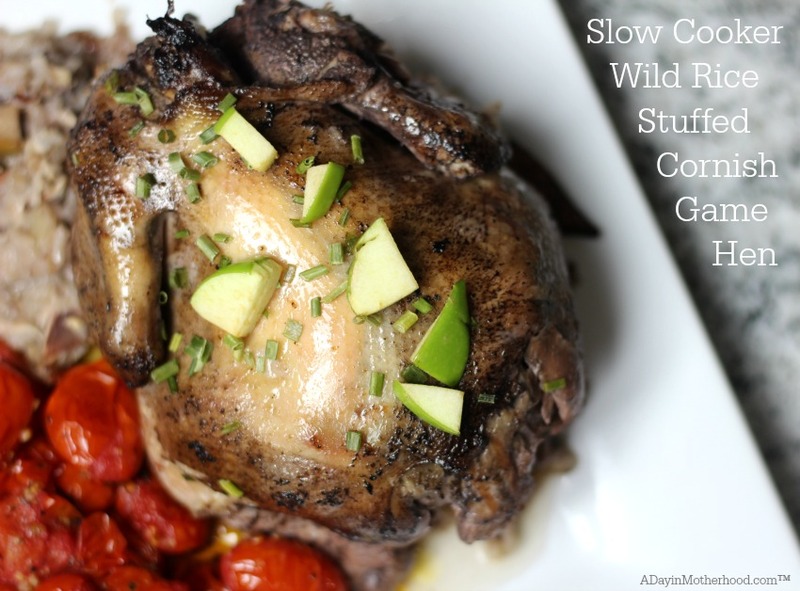 It really is amazing how beautiful the Slow Cooker Wild Rice Stuffed Cornish Game Hen comes out. 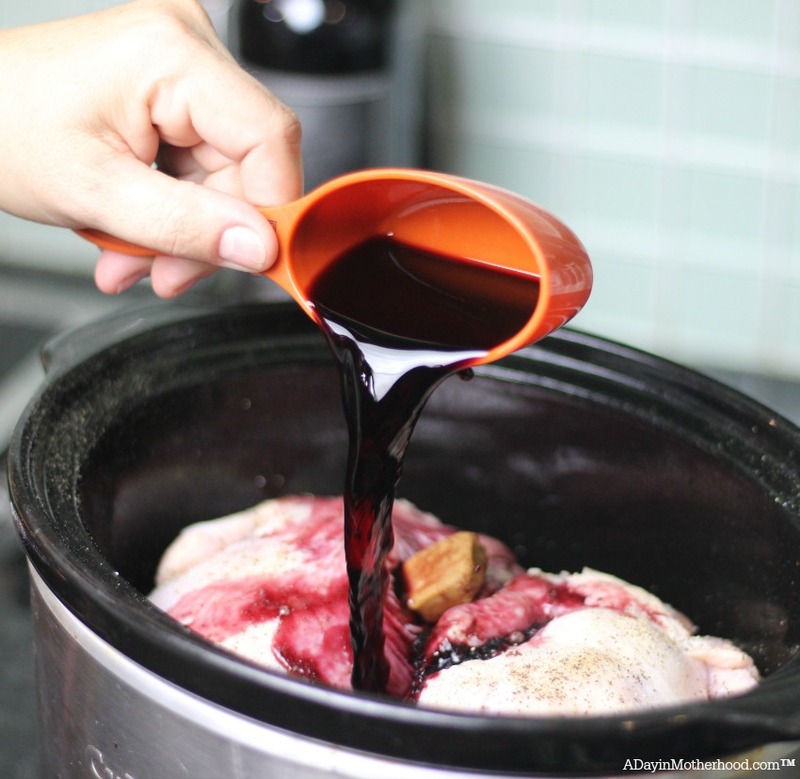 You have the option of adding the wine into the recipe for a richer flavor or to use water or chicken broth and just serve it on the side. I added the wine in because I love the warm flavor on a protein that can absorb it well. It will give the hens a slightly purple hue but the taste is amazing! Take 2 of the Tyson® All Natural Premium Cornish Hens from the 6 pack, you can double this recipe if you have a larger slow cooker, and open the packages. Gently rinse the outside and inside of the bird. Pat dry with a paper towel and set aside. 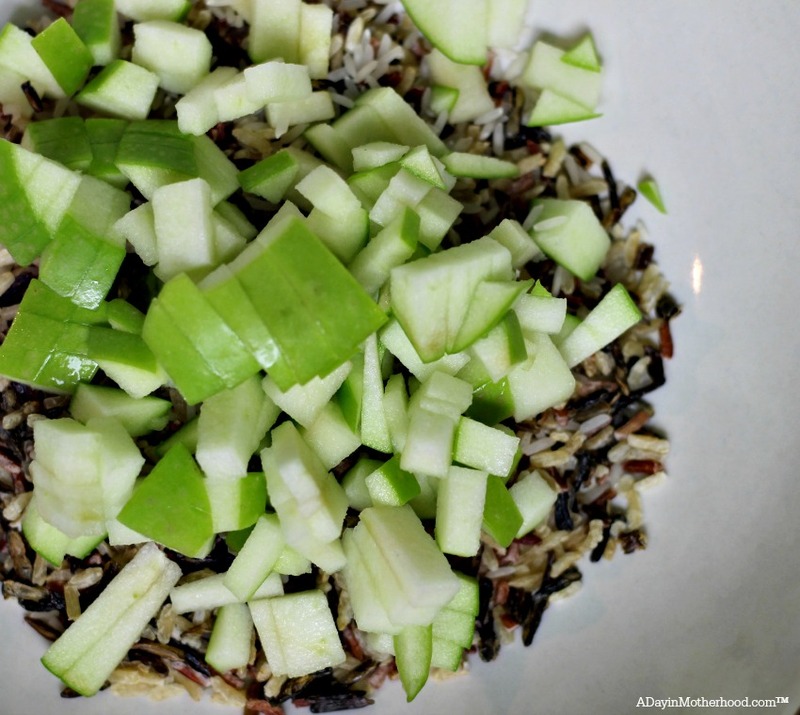 In a bowl, add the wild rice, apples, onion, thyme, basil and garlic powder. Mix well. 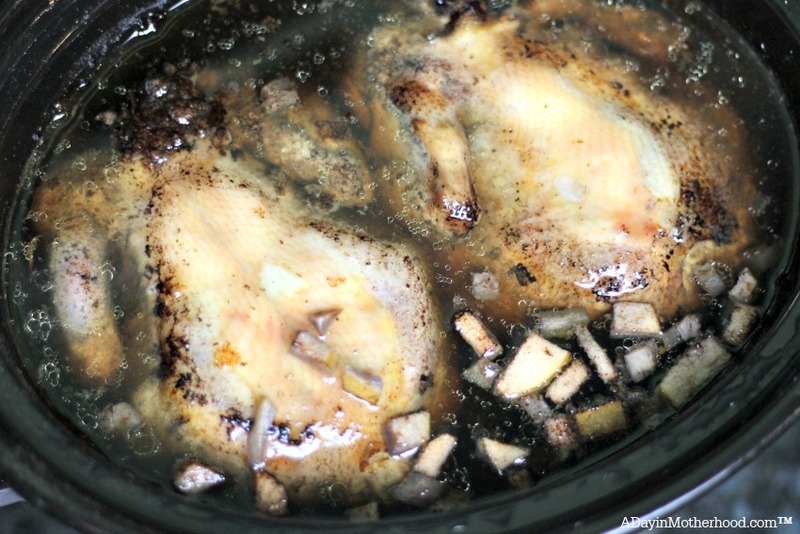 Stuff the Tyson® All Natural Premium Cornish Hens with the mixture and place breast down in the slow cooker. Salt and pepper generously. Add the Constellation Wine (Ravage Cabernet Sauvignon) and then add enough water to cover the hens completely. You do have the option to leave the wine out and to add more water, or to add a 1/2 cup of chicken broth in it’s place. You can even season the dish any way you want. Add grill seasoning instead of thyme, basil and garlic powder. Any good herb will sing in this dish. 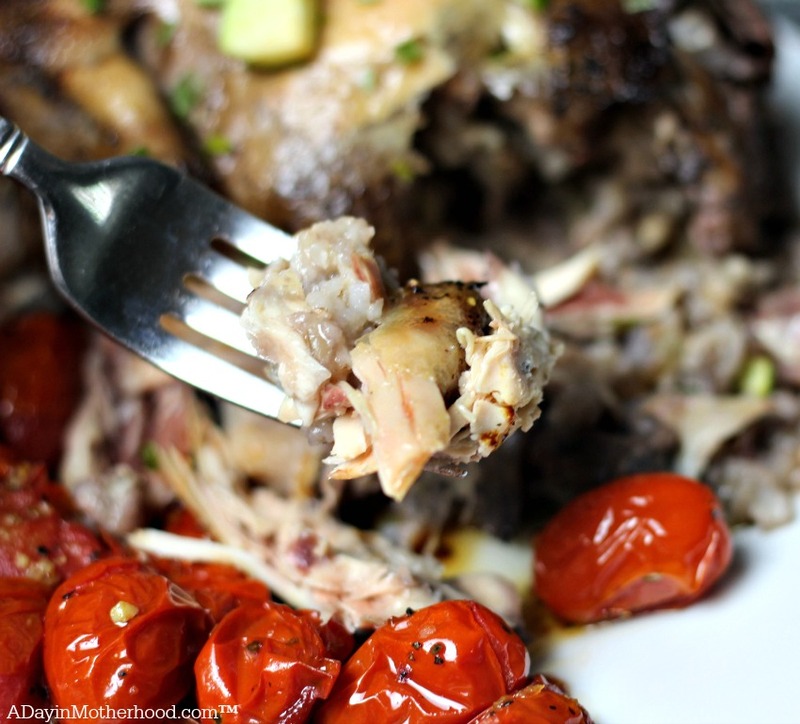 The advantage of the slow cooker is that the meat, literally, just falls from the bone! If you are making a stuffing, you can make a few Tyson® All Natural Premium Cornish Hen, easily dice up the meat and add it in as an extra protein source! It comes out that juicy and delicious! 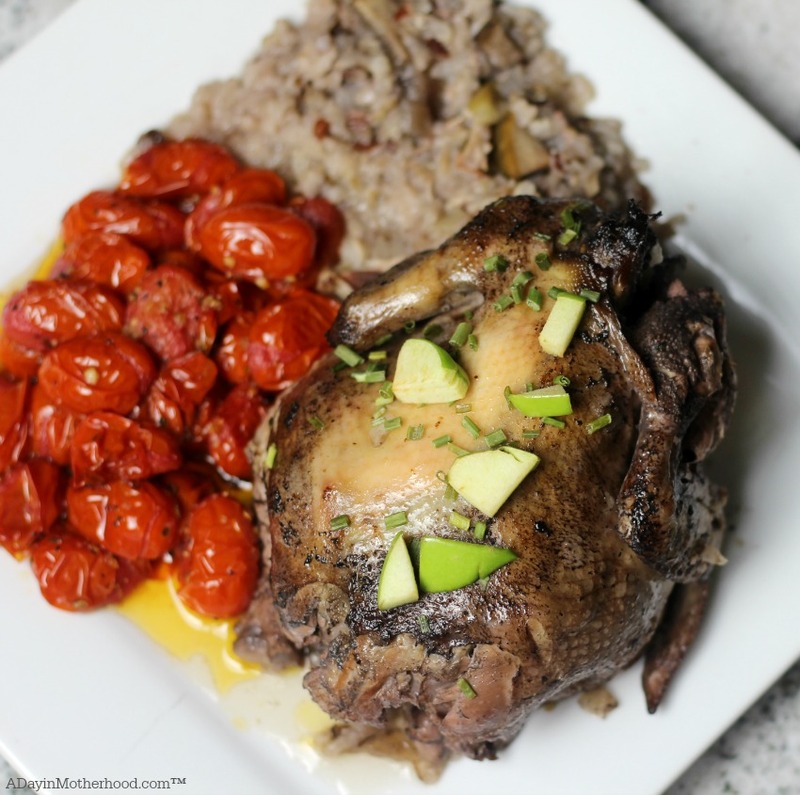 I served my Slow Cooker Wild Rice Stuffed Cornish Game Hen Recipe with some whole roasted tomatoes and enjoyed an elegant dinner with a glass of Constellation Wines Ravage Cabernet Sauvignon to really enhance the flavor. Have you ever made Tyson® All Natural Premium Cornish Hens? This protein with no added hormones or steroids is a wonderful holiday solution for family and friends! What recipe would you make? Do the game hens need to be thawed before starting, or does 8 hours of low heat cooking thaw and cook? 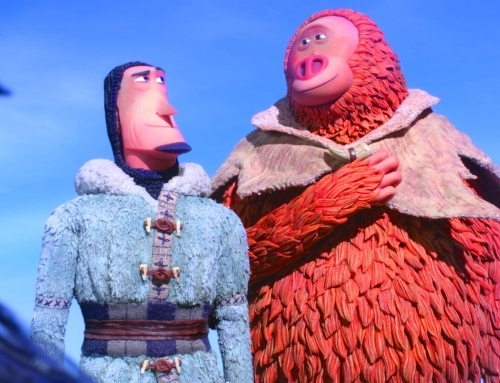 Hi Mike, You can do them from frozen, I think mine were about 50% thawed. You just have to be able to stuff the rice into the cavity. If you go from frozen, rinse the end with cold water and remove the innards. Once that is done you can stuff and cook on low for the 8 hours. If you don’t go from frozen, you can cut the time to 5-6 hours. 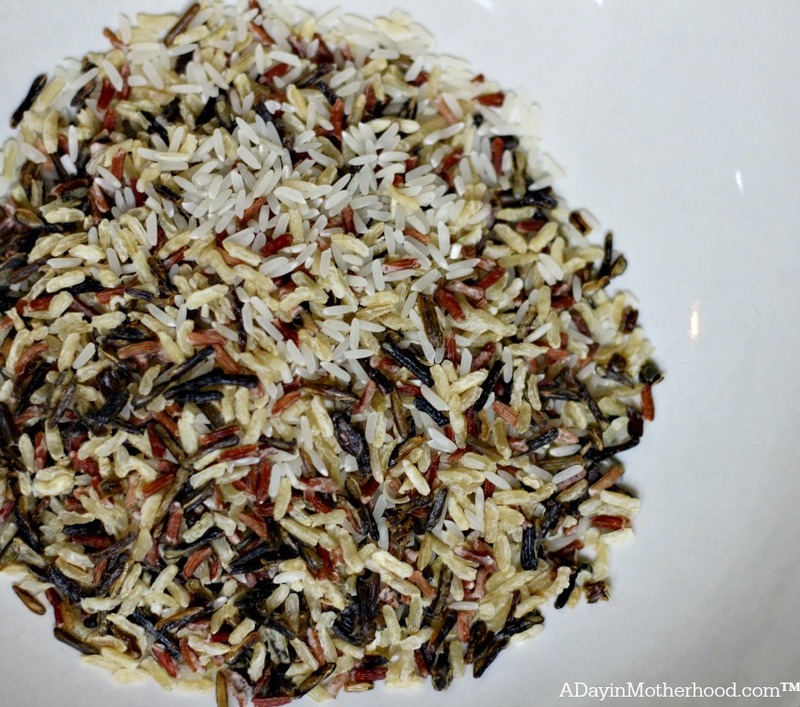 I think the recipe should say “wild rice mix,” since the photo shows white rice (and yellow rice) as well.